It is with a heavy heart that we tell you today that financial pressures have forced upon us the decision to end printed production of The PeaceWorker, although our award-winning news magazine continues to be available online at www.peaceworker.org. For the past two years Oregon PeaceWorks, like most other nonprofits, has found it very difficult to meet its financial obligations. While you who are reading this are among those who have given generously to keep OPW working for peace, revenue has nevertheless declined disastrously, due to the state of the economy, and now the crisis in Haiti has drawn off even more dollars that we might otherwise have received. We have cut staff and staff travel, reduced PeaceWorker printing and free distribution and entrusted many state networking services to oregonprogressivenetwork.org in an effort to cut costs. Now the fiscal responsibility we bear leaves us no choice but to move The PeaceWorker entirely to the Web as a further cost-cutting measure. A lot of the printed media has had to make this change, as you are probably aware. The good news is that The PeaceWorker’s presence on the web is now very robust and exciting, so if you have not visited www.peaceworker.org and subscribed to our RSS service there, you are missing a wonderful resource. In case you are not aware of it, we want you to know how much our tiny staff, headed by Executive Director Peter Bergel, accomplishes on OPW’s shoestring budget. • Salem’s MyPeace Project, using art to express individual peace visions. • The Peace Visioning Brainstorm Project, which will collect peace visions from people in cities and towns all over Oregon in a large database. • The Peace Visioning Virtual Think Tank – an online gathering of peace activists from across the country that will actually craft the comprehensive peace vision, using the visions database and other resources. • Gives presentations to introduce the 5% Solution. • Urges people to pledge to reduce their carbon footprints by 5% per year. • Offers helpful materials and advice to help pledgers keep their pledges. 3. The PeaceWorker: even as OPW has been forced to curtail the printed PeaceWorker, it has moved it to the Web. There it is available not only to Northwest residents, but to people all over the globe. People from 65 countries have visited the OPW website. The PeaceWorker has been an important part of OPW’s program now for more than 21 years and, as the voice of a state peace group, it is practically unique. It carries news and analysis from the entire progressive movement, as well as publicizing what the entire peace movement is doing. 4. Opposition to wars and nuclear weapons: OPW has long been defined by its ongoing work to prevent and end wars and reliance on nuclear weapons. This work continues through public education and lobbying Congress. 5. Websites, Facebook and Twitter: OPW has its main website at www.oregonpeaceworks.org, a separate website for The PeaceWorker at www.peaceworker.org, another website for the MyPeace Project at www.mypeaceproject.org, a page on Facebook and a regular Twitter feed at www.twitter.com/thepeaceworker. These resources provide a wide spectrum of resources to OPW members and other peace workers across the world. 6. Annual events: OPW sponsors Oregon’s best peace party, Give Peace a Dance, now in its 26th year, serves organic black bean burritos from its annual booth at the Salem Art Fair, conducts the Great Getaway Raffle every fall and welcomes its members every December at its annual meeting. 7. Education: In addition, Peter Bergel speaks regularly on peace issues in a variety of venues, writes prolifically, offers nonviolence training when asked, and supervises OPW volunteers and interns. A peace and environmental activist since his college days, he is a “long-distance runner” and a precious resource in Oregon’s progressive community. He and Jeanette Hardison, who helps us with fundraising, have also donated generously when they could. • Of course, we desperately need your financial contribution right away. • You can send a check, of course, but you can also make a regular donation by authorizing a monthly or quarterly Electronic Funds Transfer from your bank account. This provides crucial, dependable “base support” to OPW. If you prefer not to authorize an automatic donation through your bank, and you bank online, you can also set up a scheduled payment from your bank to ours yourself. • You can make a monthly, quarterly or annual pledge today and we’ll remind you when it’s due. 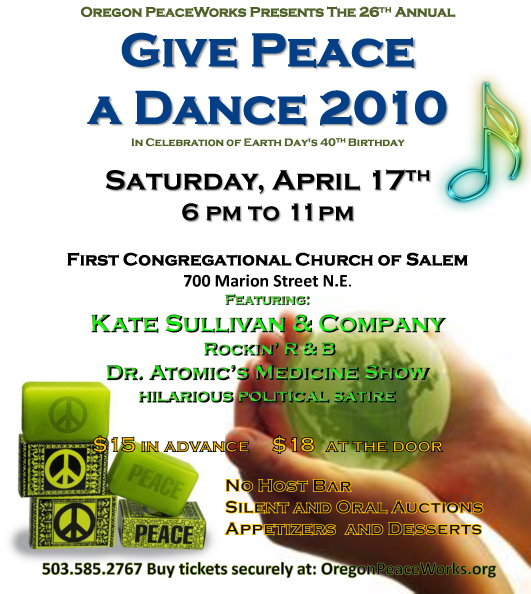 • You can donate an auction item to be sold at Give Peace a Dance. It can be a saleable item or an exciting experience. • You can donate an item that we can sell on eBay. • You can volunteer to help with one of our projects. Our new Office Manager Donna Gerry is ready to match your skills, interests, and available time with our needs. Please email her at donna@oregonpeaceworks.org or call 503.585.2767. We believe OPW is crucially important to Oregon’s peace movement. That’s why we serve on the OPW Board. We are asking you to help us make sure OPW remains active and working for peace – in Oregon, in the Northwest, and in the world.